I get digitally interrupted all day long. Emails, texts, WhatsApps, Skype, push notifications – it never ends. For me, one of the hardest things to ignore is email. I’ve been conditioned well. In an effort to curb some of the pull that I feel when I see a new email, I’ve realized I have to take control of how I get those notifications, especially on my phone. If I see there’s a new email, I have to check it. My OCD won’t let me otherwise. It has become easier and more efficient for me to close my email during the day to get actual work done, checking on it periodically, but I’ve found it much harder to control my phone as I want those accounts for when I need them, I just also want some peace. Fetch to the rescue. This is an iOS feature that is included with your Mail setting. When you have an email account on your phone, you get to decide how you want it to check that account. In the past I had selected it check email every few minutes. Changing that option allows me to then control how often that account is checked. If I don’t physically tell it to check the email, no email is checked. It’s beautiful. 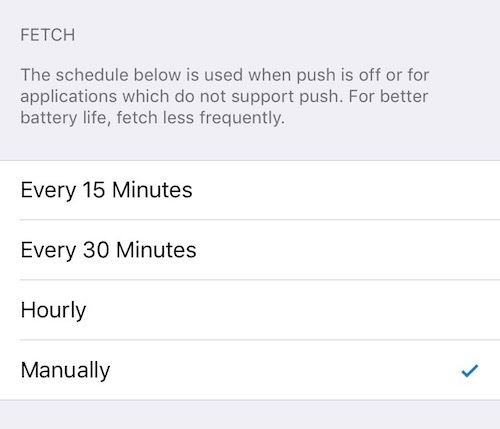 Settings > Mail > Accounts, you’ll see an option at the bottom called “Fetch New Data”. Click that. First off, turn off Push. This means your new email won’t just be delivered (or “pushed”). Then for each account listed you can decide whether you want Fetch or Manual. Choose Fetch. Lastly, at the bottom is the Fetch schedule. You have a few options here, I chose Manually. Some may want hourly, totally your call. The difference is that you are now in control of how email gets delivered to your phone.